IKEA's temporary shelter designed for refugees has been named the 2016 Beazley Design of the Year, beating the artwork for David Bowie's final album and a robotic surgeon. IKEA Foundation's Better Shelter was announced as the winner at an awards ceremony that took place at the Design Museum's new home in west London this evening. Dezeen is media partner for Beazley Designs of the Year, an annual programme celebrating design that "promotes or delivers change, enables access, extends design practice or captures the spirit of the year". Selected as the winner of the architecture category, IKEA's Better Shelter beat five other category winners to claim the overall prize for its "outstanding contribution towards the global issue of population displacement". The IKEA Foundation launched its flat-pack emergency shelter back in 2013 to offer an alternative to the tents often used to house refugees and displaced people, of which there are now more than 65 million worldwide. Designed to last three years, the shed-like structure is made of lightweight polymer panels laminated with thermal insulation, each of which clip onto a steel frame. 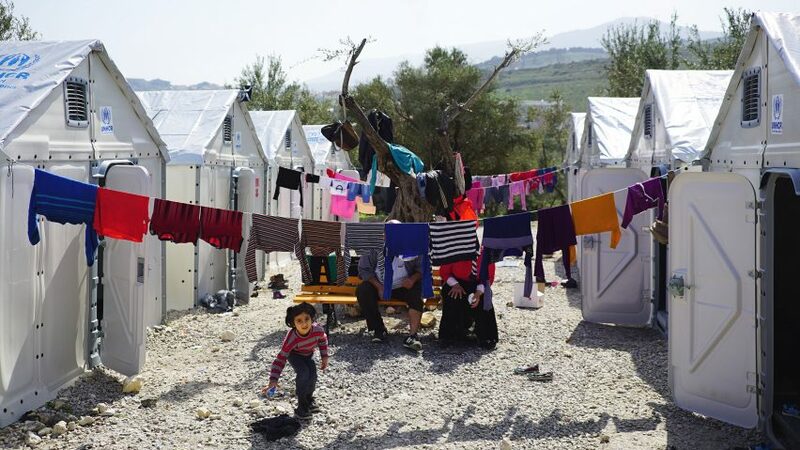 "Better Shelter tackles one of the defining issues of the moment: providing shelter in an exceptional situation whether caused by violence and disaster," said jury member Jana Scholze of Kingston University. "It shows the power of design to respond to the conditions we are in and transform them. Innovative, humanitarian and implemented, Better Shelter has everything that a Beazley Design of the Year should have." The jury – which included Dezeen's editor-in-chief Marcus Fairs, designer John Morgan, entrepreneur Loyd Grossman and MB Christie of Tech City – also awarded winners across the digital, fashion, graphics, product and transport categories. Among them was the album artwork for David Bowie's final record, which was designed by Jonathan Barnbrook to reflect the musician's mortality. "The graphics category caused heated debate among the jury," said Morgan. "The Blackstar design is an iconic piece of graphic design that defined an important moment in musical history." The OpenSurgery robotic surgeon, which could allow users to carry out procedures at home, took the prize for the digital category, while the Lumos light-up bicycle helmet was the top pick of the transport projects. In the fashion category, it was a video exploring advertising through the eyes of children that won the award. Titled Children vs Fashion, it was created by children from CEIP La Rioja School in Madrid, Spain. Space Cup, a coffee cup for astronauts, topped the product shortlist. All of this year's shortlisted projects are on show in an exhibition at the Design Museum until 19 February 2017. In an interview with Dezeen ahead of the announcement, Gemma Curtain, curator of Beazley Designs of the Year, said this year's displayed greater engagement with world problems than previous years. "There is a seriousness in the nominations this year," she said. "Perhaps there's less exuberance, less fun, less innovation for innovation's sake." "Instead, designers are looking to create cleaner water, purer air, less pollution, less waste." Last year, the accolade was awarded to Human Organs-on-Chips, a microdevice lined with living human cells to mimic the complex tissue structures of the human body.